Fox Valley Hands of Hope’s volunteer program is ever changing and growing with our unique community. FVHH is dedicated to meeting the needs of our clients while utilizing the time and talents of our volunteers. 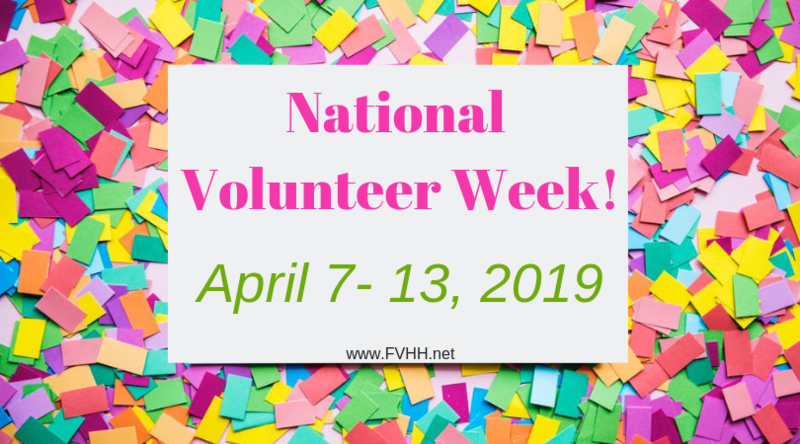 With new volunteer opportunities, our volunteer need growing, and new Continued Education being added to the calendar regularly — you’re sure to find your fit here on the FVHH Volunteer Team! 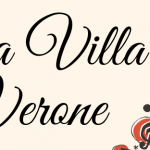 Check out what we have coming up for volunteers this year! Here at FVHH we would like to celebrate you as well, so save the date! 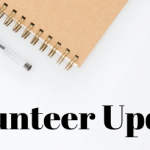 Our 2019 Volunteer Appreciation event has been planned for Wednesday, April 17 from 5 to 7 pm. More information to come! Training includes material on adult grief. 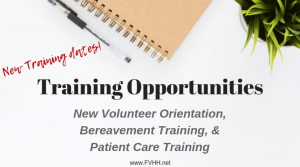 This training is for volunteers interested in providing One-on-One Bereavement support. Pre-requisite to this session is New Volunteer Orientation. RSVP by March 26. 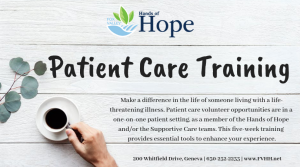 Patient Care Training- Tuesdays, April 9 – May 7, 2019 from 6:00-9:00 p.m.
Make a difference in the life of someone living with a life-threatening illness. Patient care volunteer opportunities are in a one-on-one patient setting, as a member of the Hands of Hope and/or the Supportive Care teams. This 5-week training provides essential tools to enhance your experience. RSVP by March 26. 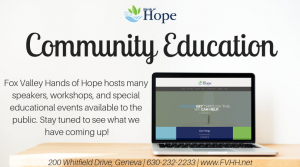 Comfort Touch Workshop- Wednesday, June 12, 2019 at 11:00 a.m. Please join Wende for her interactive workshop on Comfort Touch. This modality of massage was developed by LMT Mary Kathleen Rose of Colorado for the specific needs of those who are elderly or in-firmed. These techniques can be a part of your client/patient visits or something you use with family or friends that ease pain & stress and provide comfort. Dress comfortably and be prepared to enjoy your morning learning something wonderful and new.